All the Details on Red, White & BOOM! Updated June 19, 2017 with 2017 Red, White and BOOM! information. For more information regarding the event, please visit RedWhiteandBOOM.org. Festival season is in full swing, and Red, White & BOOM! will energize downtown Columbus with a day of music, food, activities and of course – fireworks. 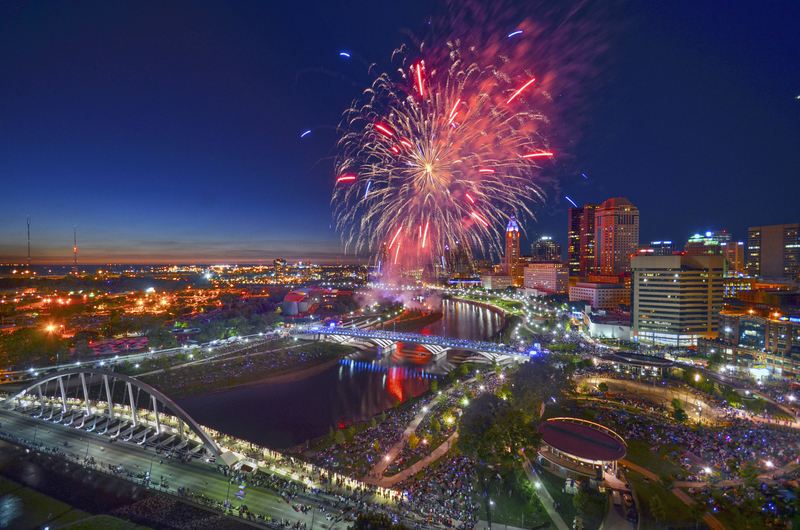 The Scioto Mile provides an outstanding backdrop for one of the largest displays of Independence Day fireworks in the Midwest. The event begins Monday, July 3 at noon. For more information, a full schedule of performances and a list of activities, visit www.redwhiteandboom.org. You won’t want to miss it! WHAT: Red, White & BOOM! WHEN: Monday, July 3 | noon to 11:30 p.m. The Scioto Mile Fountain will be turned off Sunday, July 2 at 6 p.m. and will resume operation Tuesday, July 4 at 10:30 a.m. Bicentennial Park restrooms will be closed on July 3 during Red, White & BOOM! Genoa Park will be closed to the public from Thursday, June 29 through Tuesday, July 4 for fireworks operations. Public set-up for Red, White & BOOM! may begin at 6 p.m. on Sunday, July 2. Anything placed before 6 p.m. on July 2 will be collected and taken to Bicentennial Park, 233 Civic Center Dr.
To keep your parks beautiful, we request that personal canopies, tarps and blankets not be set-up until July 3. Areas should be marked with items that don’t present a danger to the public. STAKES AND POSTS ARE PROHIBITED as they pose a danger to playing children and can cause damage to irrigation systems. Beginning Thursday, June 29, the trail on the west side of the Scioto River between the Rich St./Town St. Bridge and Broad Street Bridge will be closed until Tuesday, July 4 at noon. Beginning Sunday, July 2, the trail on the east side of the Scioto River between the Rich St./Town St. Bridge and the Broad Street Bridge will be closed until Tuesday, July 4 at noon. On July 3, from 11 a.m. until after the fireworks, all public watercraft will be prohibited on the Scioto River between the railroad trestle at the south end of North Bank Park to the railroad trestle south of the Main Street Bridge. Columbus Fire and Columbus Police will be on the water for enforcement. The Nationwide Blvd. launch area will be available for hand-carry watercraft only. Concession operator HERO USA will host prescheduled watercraft tours. Limited parking will be available for individuals to hand carry canoes and kayaks. The Lower Scioto ramp at the Scioto Audubon Metro Park will be open for trailers and motorboats.